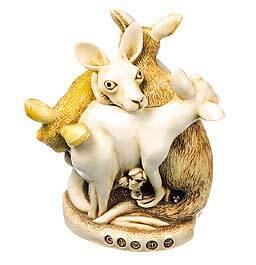 This box figurine features 4 adult kangaroos, 7 babies, and Noel Wiggins tucked in a pouch wearing one of his Harmony Ball ties. Noel wears dark sunglasses in most of the pieces and clear glasses in a small quantity (257). The mouse keeps a low profile tucked away to Noel’s right. The ubiquitous tin can litter appears again. The interior of Version 1 has a baby kangaroo sleeping with its teddy bear. The interior of Version 2 contains a pair of boxing gloves. Inscriptions include “MOB,” a generic term for kangaroos; “Blue Flier,” a female kangaroo with a blue grey coat; and “Boomer,” a male kangaroo. The inscription on the inside of the rim is a dedication to HK’s former Australian distributor, Henrik. The inscription “Griff’s Last Purr” around the base is a dedication to the Perry family cat, Griff, who died 22.7.97 at age 18. Hallmarks include ©, heart, HBC logo, ed.#, and Pc.